Miriam Toews' father left the hospital where he was being treated for depression and hitched a ride to a nearby small town. After speaking with a waitress at the diner, he walked onto the train tracks and took his own life. After his death, Miriam collected the pieces of paper she had given to her father. She wrote in his voice, reminding him that 'things would be alright' and that 'my family loves me.' Swing Low is Miriam's attempt to bring her father's final days and thoughts to life. This book is marketed as a memoir and it is, to some extent. The author spent a great amount of time speaking with her mother and other family members to better understand her father. But a lot of this book comes from her imagination. She admits that her father rarely spoke to the family and seemed to use all of his energy in his beloved job as a school teacher. There is little she knows or understands about the father who impacted her life so greatly. Toews imagines her father writing his thoughts down during his final days in the hospital. In addition to suffering from bipolar disorder, his memory is starting to go as well. Mel writes about his fears about his family and the hospital staff and tries to remember the life that he is starting to forget. This is a situation which obviously causes Miriam and her entire family a great deal of pain. To know that your father is an enthusiastic teacher by day who spends the evening in bed not speaking to you create a very difficult home life. This memoir is Miriam's way to better understand a man who was largely distant and find some closure about his absence from her life and his tragic death. It is a very compassionate story and I think that speaks volumes about Miriam as a person. She is able to look past her own pain and see the difficulties that her father dealt with every day. 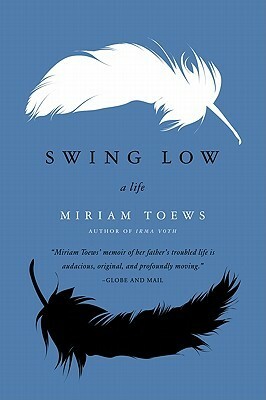 Swing Low is a cathartic journey for Toews and for anyone who has lost a parent tragically. The power of this book though, is that it transcends even these limits. The writing is beautiful, concise, and powerful. It gives haunting insight into the life of someone living with mental illness and causes each of us to think about the ways we care for and relate to the people we love most. I found it incredibly brave and forgiving. She has also written two novels, which I have to look into now. This sounds like such a powerful read, although I'm glad you have told me in advance that it's not solely a memoir. I do think teaching is a job that requires so much 'life' during the day that all you want to do is sit quietly at least when the day is done. It's sort of a new genre, but one that I found very effective. I can certainly understand teachers needing some quiet at the end of the day. I think they have one of the toughest jobs out there and I admire them so much. This sounds like the kind of book I'd definitely want to read, especially since I have severe depression in the family. I think the great thing about this book is that it really makes you think about your relationships, whether they are strong or in need of some work. I hope you find it as moving as I did.